This chunky, second-generation DSLR is chiefly all about speed. Not only do you get 14fps burst shooting with full AF/AE tracking and 16fps in Live View, but the dual DIGIC 6+ processors ensure it can pump out unlimited sequential JPEGs or up to 170 Raw files without slowing down. 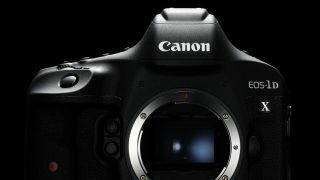 As well as being seemingly perfect for those shooting sports, the other big news is that it also comes with a full-frame CMOS sensor that delivers 20.2MP stills. This is only a modest increase over the original EOS-1D X’s 18.1MP resolution, but noise levels at higher ISOs are helpfully kept down. This sensor offers an ISO range that can be expanded to settings equivalent to ISO 50 up to 409,600, while a 61-point AF system includes 41 cross-type points. We also see the introduction of 4K video capture at up to 60p here, with the further useful option extracting 8.8MP stills from captured footage. Flicker detection, which was originally introduced on Canon’s EOS 7D Mark II to prevent inconsistencies when shooting under artificial light, has also made the cut. This is a big brute of a camera in the hands, with a magnesium alloy shell and weatherproof seals, together with a beefy twin-grip arrangement that allows to shoot in both portrait and landscape orientations with ease. The controls accessible when the vertical grip is in use particularly impress; there’s no need to reach to a different area to change the autofocus point, for example, as that control is present both ways. Though its predecessor had a 3.2in screen like this one does, the resolution has been upped to 1.62million dots here, which makes for a noticeable visual improvement; images appear to pop out of the screen. In terms of image quality, its current technology deems that 20.2MP on a full-frame sensor enables the pixels to be made large enough to keep noise levels within acceptable limits at high sensitivity settings, while still producing an image large enough to make full-bleed, double-page spreads for print. In a nutshell, here we have a DSLR suitable for not just action photography, but also just about any professional photography specialism. Given that, and the fact that this is very obviously a range-topping, class-leading tool, perhaps the price tag isn’t as prohibitive as it may first appear.